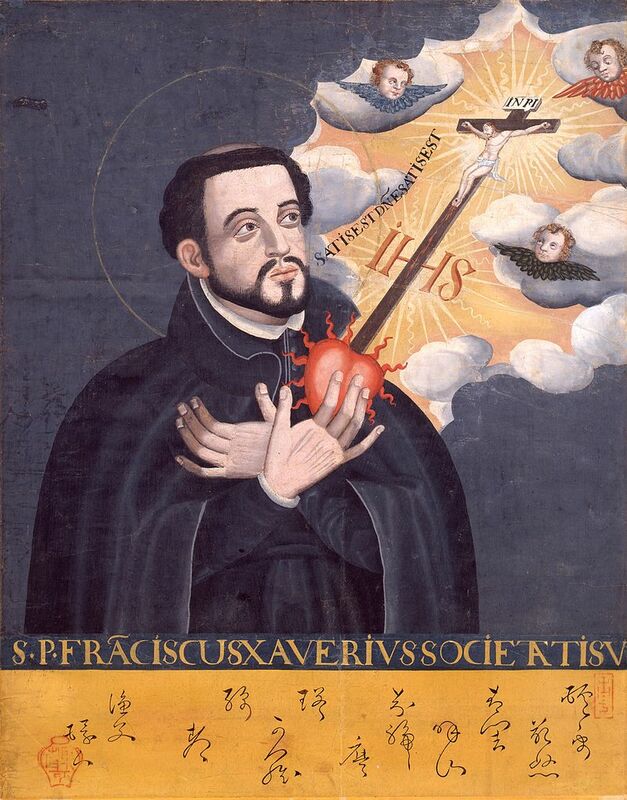 Today is the birthday (1506) of Francis Xavier, S.J. (born Francisco de Jasso y Azpilicueta) co-founder of the Society of Jesus, companion of Saint Ignatius of Loyola and one of the first seven Jesuits who took vows of poverty and chastity at Montmartre, Paris in 1534. He led an extensive mission into Asia, mainly in the Portuguese empire of the time, and was influential in Christian evangelizing, most notably in India. Xavier was born in the royal castle of Xavier, in the kingdom of Navarre. He was the youngest son of Juan de Jasso y Atondo, seneschal of Xavier castle, who came from a prosperous farming family and had received a doctorate in law at the University of Bologna, and later became privy counsellor and finance minister to King John III of Navarre (Jean d’Albret). Francis’s mother was Doña María de Azpilcueta y Aznárez, sole heiress of two noble Navarrese families. He was thus related to the great theologian and philosopher Martín de Azpilcueta. In 1512, Ferdinand, king of Aragon and regent of Castile, invaded Navarre, initiating a war that lasted over 18 years. Three years later, Francis’ father died when Francis was only 9 years old. In 1516, Francis’ brothers participated in a failed Navarrese-French attempt to expel the Spanish invaders from the kingdom. 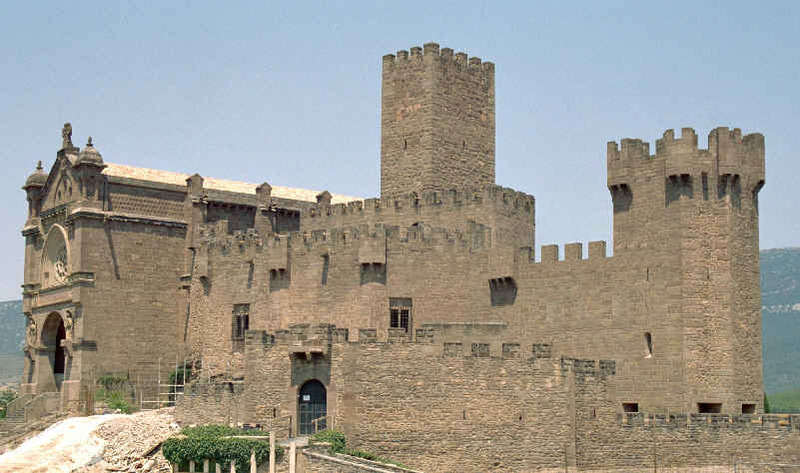 The Spanish governor, cardinal Cisneros, confiscated the family lands, demolished the outer wall, the gates, and two towers of the family castle, and filled in the moat. In addition, the height of the keep was reduced by half. Only the family residence inside the castle was left. In 1525, Francis went to study in Paris at the Collège Sainte-Barbe, University of Paris, where he spent the next 11 years. In the early days he acquired some reputation as an athlete. In 1529, Francis shared lodgings with his friend Pierre Favre. A new student, Ignatius of Loyola, came to room with them. At 38, Ignatius was much older than Pierre and Francis, who were both 23 at the time. Ignatius convinced Pierre to become a priest, but was unable convince Francis, who had aspirations of worldly advancement. At first Francis regarded the new lodger as a joke and was sarcastic about his efforts to convert students. When Pierre left their lodgings to visit his family and Ignatius was alone with Francis, he was able to slowly break down Francis’ resistance. In 1530 Francis received the degree of Master of Arts, and afterwards taught Aristotelian philosophy at Beauvais College, University of Paris. On 15 August 1534, seven students met in a crypt beneath the Church of Saint Denis (now Saint Pierre de Montmartre), in Montmartre outside Paris. They were Francis, Ignatius of Loyola, Alfonso Salmeron, Diego Laínez, Nicolás Bobadilla from Spain, Peter Faber from Savoy, and Simão Rodrigues from Portugal. They made private vows of poverty, chastity, and obedience to the Pope, and also vowed to go to the Holy Land to convert Muslims. Francis began his study of theology in 1534 and was ordained on 24th June 1537. In 1539, after long discussions, Ignatius drew up a formula for a new religious order, the Society of Jesus (the Jesuits). Ignatius’ plan for the order was approved by Pope Paul III in 1540. In 1540 king John III of Portugal had Pedro Mascarenhas, Portuguese ambassador to the Vatican, request Jesuit missionaries to spread the faith in his new Indian possessions, where the king believed that Christian values were eroding among the Portuguese. After successive appeals to the Pope asking for missionaries for the East Indies under the Padroado agreement, John III was encouraged by Diogo de Gouveia, rector of the Collège Sainte-Barbe, to recruit the newly graduated students who had established the Society of Jesus. Loyola promptly appointed Nicholas Bobadilla and Simão Rodrigues. 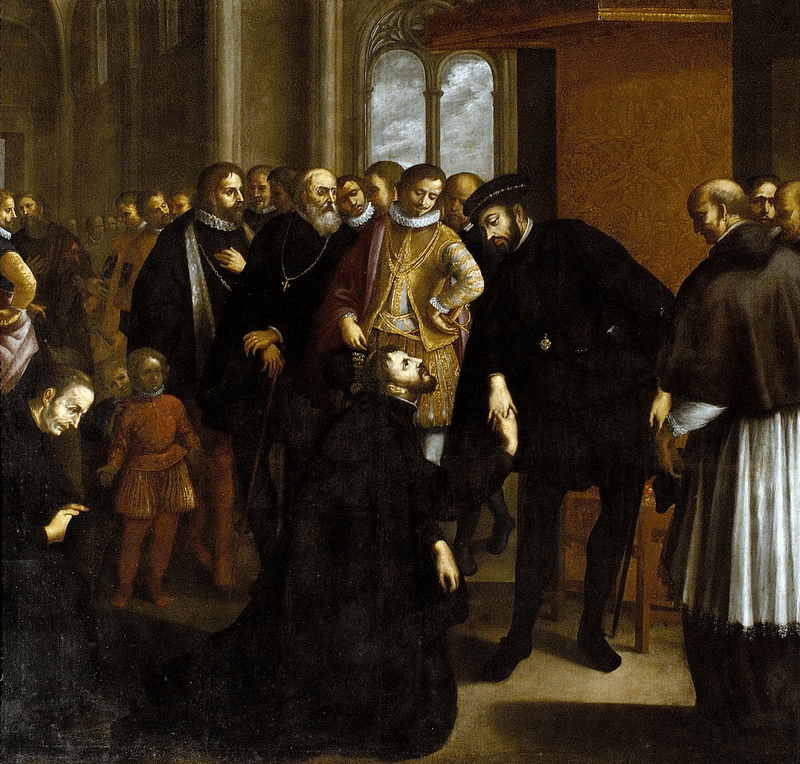 At the last moment, however, Bobadilla became seriously ill. With some hesitance and uneasiness, Ignatius asked Francis to go in Bobadilla’s place. 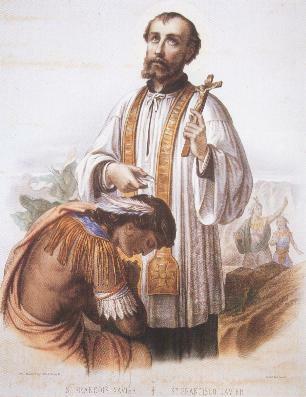 Thus, Xavier accidentally began his life as the first Jesuit missionary. Leaving Rome on 15th March 1540, in the Ambassador’s train, Francis took with him a breviary, a catechism, and De Institutione bene vivendi by Croatian humanist Marko Marulić, a Latin book that had become popular in the Counter-Reformation. According to a 1549 letter of F. Balthasar Gago in Goa, it was the only book that Francis read or studied. Francis reached Lisbon in June 1540 and four days after his arrival, he and Rodrigues were summoned to a private audience with the king and queen. Xavier devoted much of his life to missions in Asia, mainly in four centers: Malacca, Amboina and Ternate, Japan, and China. His growing information about new places indicated to him that he should go to what he understood were centers of influence for the whole region. China loomed large from his days in India. Japan was particularly attractive because of its culture. For him, these areas were interconnected and could not be evangelized separately. Xavier left Lisbon on 7th April 1541, his 35th birthday, along with two other Jesuits and the new viceroy Martim Afonso de Sousa, on board the Santiago. As he departed, he was given a brief from the pope appointing him apostolic nuncio to the East. From August until March 1542 he remained in Portuguese Mozambique, and arrived in Goa, then capital of Portuguese India on 6th May 1542. Following quickly on the great voyages of discovery, the Portuguese had established themselves at Goa 30 years earlier. 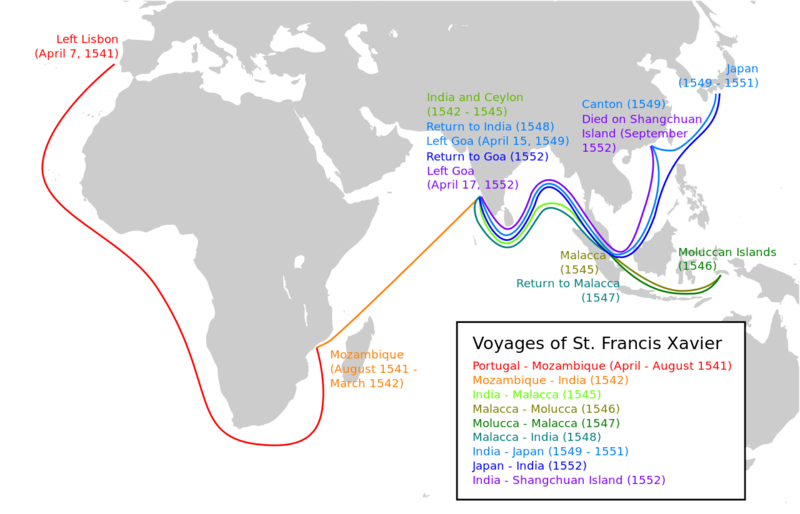 Francis primary mission, as ordered by John III, was to restore Christianity among the Portuguese settlers. According to Teotonio R. DeSouza, recent critical accounts indicate that apart from the posted civil servants, “the great majority of those who were dispatched as ‘discoverers’ were the riff-raff of Portuguese society, picked up from Portuguese jails.” Nor did the soldiers, sailors, or merchants come to do missionary work, and Imperial policy permitted the outflow of disaffected nobility. Many of the arrivals formed liaisons with local women and adopted Indian culture. Missionaries often wrote against the “scandalous and undisciplined” behavior of their fellow Christians. The Christian population had churches, clergy, and a bishop, but there were few preachers and no priests beyond the walls of Goa. Xavier decided that he must begin by instructing the Portuguese themselves, and gave much of his time to the teaching of children. The first five months he spent in preaching and ministering to the sick in the hospitals. After that, he walked through the streets ringing a bell to summon the children and servants to catechism. He was invited to head Saint Paul’s College, a pioneer seminary for the education of secular priests, which became the first Jesuit headquarters in Asia. Xavier soon learned that along the Pearl Fishery Coast, which extends from Cape Comorin on the southern tip of India to the island of Mannar, off Ceylon (Sri Lanka), there was a group of clans called Paravas. Many of them had been baptized ten years before, merely to please the Portuguese, who had helped them against the Moors, but remained uninstructed in the faith. Accompanied by several native clerics from the seminary at Goa, he set sail for Cape Comorin in October 1542. He taught those who had already been baptized and preached to those who weren’t. His efforts with the high-caste Brahmins were unavailing. He devoted almost 3 years to the work of preaching to the people of southern India and Ceylon, converting many. He built nearly 40 churches along the coast, including St. Stephen’s Church, Kombuthurai, mentioned in his letters dated 1544. During this time, he was able to visit the tomb of Thomas the Apostle in Mylapore (now part of Madras (Chennai) then in Portuguese India). He set his sights eastward in 1545 and planned a missionary journey to Makassar on the island of Celebes (in today’s Indonesia). 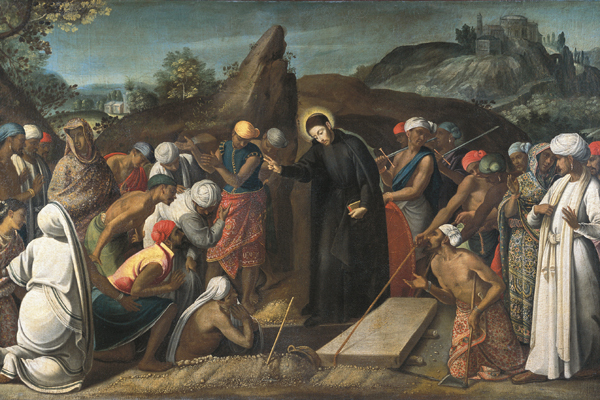 As the first Jesuit in India, Francis had difficulty achieving much success in his missionary trips. His successors, such as de Nobili, Matteo Ricci, and Beschi, attempted to convert the noblemen first as a means to influence more people, while Xavier had initially interacted most with the lower classes (later though, in Japan, he changed tack by paying tribute to the Emperor and seeking an audience with him). In the spring of 1545 Xavier started for Portuguese Malacca. He labored there for the last months of that year. About January 1546, he left Malacca for the Maluku Islands, where the Portuguese had some settlements. For a year and a half he preached the Gospel there. He went first to Ambon Island, where he stayed until mid-June. He then visited other Maluku Islands, including Ternate, Baranura, and Morotai. Shortly after Easter 1547, he returned to Ambon Island; a few months later he returned to Malacca. In Malacca in December 1547, Xavier met a Japanese man named Anjirō. Anjirō had heard of Francis in 1545 and had travelled from Kagoshima to Malacca to meet him. Having been charged with murder, Anjirō had fled Japan. 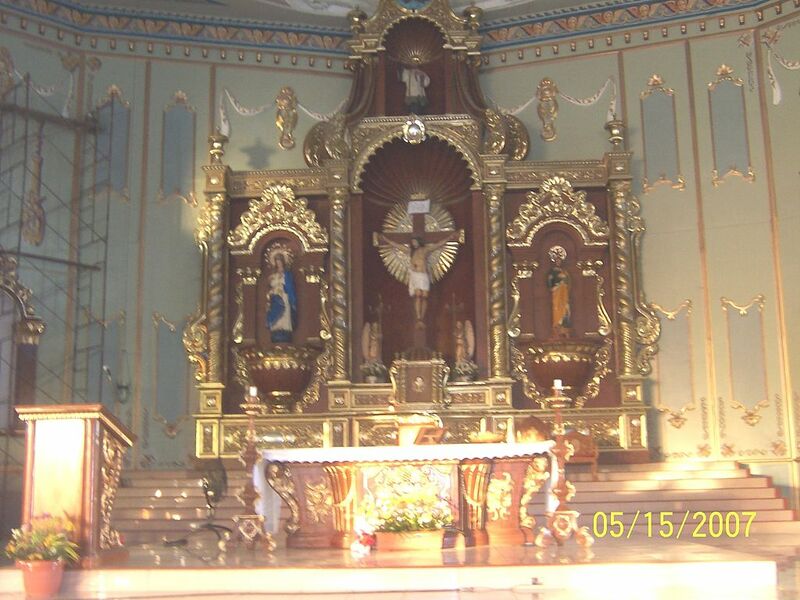 He told Francis extensively about his former life and the customs and culture of his homeland. Anjirō became the first Japanese Christian and adopted the name of ‘Paulo de Santa Fe’. He later helped Xavier as a mediator and interpreter for the mission to Japan that now seemed much more possible. In January 1548 Francis returned to Goa to attend to his responsibilities as superior of the mission there. The next 15 months were occupied with various journeys and administrative measures. He left Goa on 15 April 1549, stopped at Malacca, and visited Canton. He was accompanied by Anjiro, two other Japanese men, father Cosme de Torrès, and brother João Fernandes. He had taken with him presents for the “King of Japan” since he was intending to introduce himself as the Apostolic Nuncio. Xavier reached Japan on 27th July 1549, with Anjiro and three other Jesuits, but he was not permitted to enter any port his ship arrived at until 15 August, when he went ashore at Kagoshima, the principal port of Satsuma Province on the island of Kyūshū. As a representative of the Portuguese king, he was received in a friendly manner. Shimazu Takahisa (1514–1571), daimyō of Satsuma, gave a friendly reception to Francis on 29th September 1549, but in the following year he forbade the conversion of his subjects to Christianity under penalty of death. Christians in Kagoshima could not be given any catechism in the following years. He was hosted by Anjirō’s family until October 1550. From October to December 1550, he resided in Yamaguchi. Shortly before Christmas, he left for Kyoto but failed to meet with the Emperor. 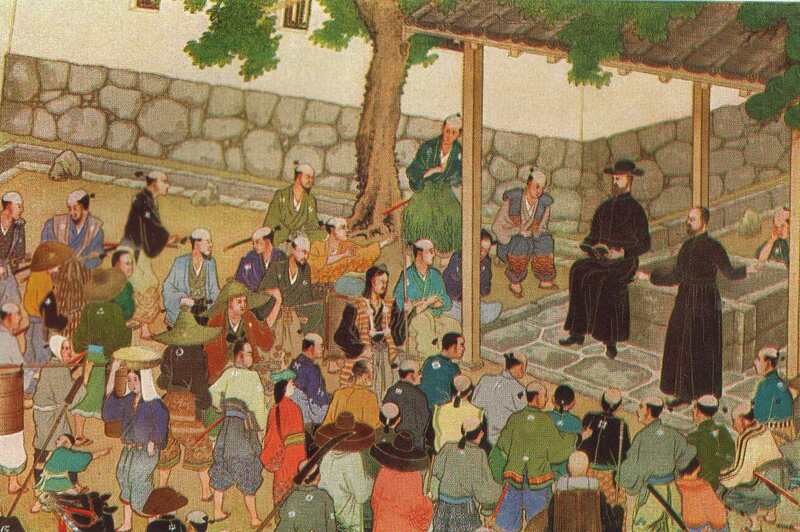 He returned to Yamaguchi in March 1551, where he was permitted to preach by the daimyo of the province. However, lacking fluency in the Japanese language, he had to limit himself to reading aloud the translation of a catechism. Francis was the first Jesuit to go to Japan as a missionary. He brought with him paintings of the Madonna and the Madonna and Child. These paintings were used to help teach the Japanese about Christianity. There was a huge language barrier as Japanese was unlike other languages the missionaries had previously encountered. For a long time Francis struggled to learn the language. Having learned that evangelical poverty did not have the appeal in Japan that it had in Europe and in India, he decided to change his approach. Hearing after a time that a Portuguese ship had arrived at a port in the province of Bungo in Kyushu and that the prince there would like to see him, Xavier now set out southward. The Jesuit, in a fine cassock, surplice, and stole, was attended by thirty gentlemen and as many servants, all in their best clothes. Five of them bore valuable articles on cushions, including a portrait of Our Lady and a pair of velvet slippers, these not gifts for the prince, but solemn offerings to Xavier, to impress the onlookers with his eminence. Handsomely dressed, with his companions acting as attendants, he presented himself before Oshindono, the ruler of Nagate, and as a representative of the great kingdom of Portugal offered him the letters and presents, a musical instrument, a watch, and other attractive objects which had been given him by the authorities in India for the emperor. For 45 years the Jesuits were the only missionaries in Asia, but the Franciscans also began proselytising in Asia as well. Christian missionaries were later forced into exile, along with their assistants. Some were able to stay behind, however Christianity was then kept underground so as to not be persecuted. The Japanese people were not easily converted. Many of the people were Buddhist or Shinto, and did not find concepts such as Purgatory and Hell appealing, especially since Catholic faith confined their dead ancestors to Hell. Xavier was welcomed by the Shingon monks since he used the word Dainichi for the Christian God, attempting to adapt the concept to local traditions. As Xavier learned more about the religious nuances of the word, he changed to Deusu from the Latin and Portuguese Deus. The monks later realized that Xavier was preaching a rival religion and grew more aggressive towards his attempts at conversion. With the passage of time, his sojourn in Japan could be considered somewhat fruitful in that he established churches in Hirado, Yamaguchi, and Bungo. Xavier worked for more than two years in Japan and saw his successor-Jesuits established. He then decided to return to India. Historians debate the exact path he returned by, but from evidence attributed to the captain of his ship, he may have travelled through Tanegeshima and Minato, and avoided Kagoshima because of the hostility of the daimyo. ]During his trip, a tempest forced him to stop on an island near Guangzhou, China where he met Diogo Pereira, a rich merchant and an old friend from Cochin. Pereira showed him a letter from Portuguese prisoners in Guangzhou, asking for a Portuguese ambassador to speak to the Chinese Emperor on their behalf. Later during the voyage, he stopped at Malacca on 27th December 1551, and was back in Goa by January 1552. On 17th April he set sail with Diogo Pereira on the Santa Cruz for China. He planned to introduce himself as Apostolic Nuncio and Pereira as ambassador of the king of Portugal. But then he realized that he had forgotten his testimonial letters as an Apostolic Nuncio. Back in Malacca, he was confronted by the capitão Álvaro de Ataíde da Gama who now had total control over the harbor. The capitão refused to recognize his title of Nuncio, asked Pereira to resign from his title of ambassador, named a new crew for the ship, and demanded the gifts for the Chinese Emperor be left in Malacca. In late August 1552, the Santa Cruz reached the Chinese island of Shangchuan, 14 km away from the southern coast of mainland China, near Taishan, Guangdong, 200 km south-west of what later became Hong Kong. At this time, he was accompanied only by a Jesuit student, Álvaro Ferreira, a Chinese man called António, and a Malabar servant called Christopher. Around mid-November he sent a letter saying that a man had agreed to take him to the mainland in exchange for a large sum of money. Having sent back Álvaro Ferreira, he remained alone with António. He died in Shangchuan from a fever on 3rd December 1552, while he was waiting for a boat that would take him to mainland China. His relics are preserved in a number of shrines in Asia. It may seem odd for me as an ordained Christian minister to express my disapproval of Xavier’s, or any missionary’s work, and I could get in trouble for doing so with my superiors. But I am going to do it anyway. The Catholic Church (and others) used conversion to Christianity as one of many vehicles of colonial subjugation of conquered peoples. Nowhere is this more obvious than in the Americas. Asia, thank God (literally), was more resilient. Buddhist, Hindu, Shinto religions etc. were much more widespread than local religious traditions in other places, and were supported by rich and powerful rulers. These rulers knew quite well that stripping away centuries-old faiths that had been their own partners in control of the masses would weaken their control, and so they resisted mightily. I also disapprove because the foundation of Christianity is love, and if a Buddhist, Hindu, or Muslim preaches love in the name of a religion that is not named Christianity, it amounts to the same thing, and should be left alone. For Xavier I have chosen the Navarrese dish, porrusalda (literally, “leek broth”) for several reasons. First, it would have been well known to Xavier. Second, in basic form it is a Lenten dish bespeaking humility and simplicity, as befits a Jesuit. Third, I love leeks. It is really a form of leek and potato soup, but with some twists. The leeks should be the dominant flavor, and many other things can be added besides potatoes. Nowadays, carrots are a usual addition, as was pumpkin at one time. You can also add salt cod or meat – as you desire. It’s all up to you as long as the leek flavor predominates. 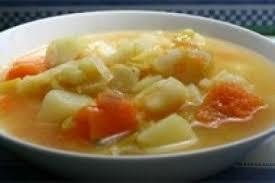 It is traditional to use water as the cooking liquid, but you can also use vegetable stock. Sauté the onions and leeks in a little olive oil over medium heat in a heavy pot until they are soft. Add water (or broth) to cover and simmer for 20 minutes. Season to taste with salt and add the potatoes and carrots. Continue to simmer until the potatoes and carrots are cooked (another 15 minutes). Add more olive oil to taste and check the seasoning. Some cooks mash the potatoes before serving to give the soup more body. You can also add a dollop of cream.